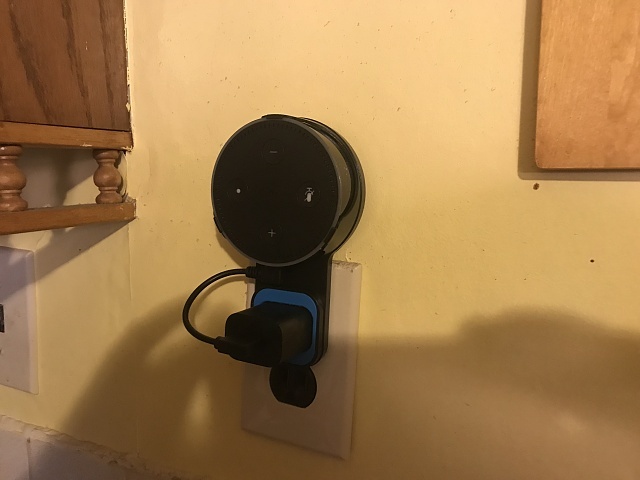 I recently bought an Echo Dot mount/holder for my Amazon Echo Dot. It allows you to mount your Dot on a wall where you have an electrical socket. This is a really fun accessory. I have mine mounted in my kitchen. The mount is constructed of mostly plastic with a bit of rubber where your brick connects to the outlet. It comes with a short USB cord to use with your brick (you'll need the brick that came with your echo for the best fit, but you should use the cord they provide. The Echo snaps in to the ring holder pretty easily BUT securely. my ematic tablet won't stop flashing e: failed to mount. last locale.